From I-190, take exit 6 to Route 12 south into Sterling's town center. To start from the Cider Mill Complex parking lot; From the town green in Sterling on Route 12, head south. Look for Waushacum Ave on your left before you come to the Route 62 junction. Head up Waushacum Ave until you spot a sign for the Cider Mill Complex on your right. Just past this sign will be a smaller sign for the Rail Trail. Turn into the lot and head left to where a dirt parking lot is located at the trails start. To start from the Gates Road parking lot; From the town green in Sterling on Route 12, head south, passing by the Route 62 turnoff. When you come to Hebert's Candies on your right, turn left down Gates Rd. The parking lot will be on the right hand side across from where the trail currently ends. Starting from the Cider Mill parking lot; Proceed past the gate along the stone dust trail. There are wetlands located along both sides of the trail to start. At a ¼ mile there is a narrow detour around a bridge they are building over a stone culvert. There is a stone bench here, as well as others scattered along the trail. You'll also spot some stone mileage markers left over from the railroad days along the trail. The trail eventually travels through woodland, with an abundance of Red and White Pine trees. After about 1.3 miles, you'll come to Waushacum Ponds. Here, a path branches left along the shoreline, while stone and wrought iron benches beckon you to sit a spell and enjoy the view. So, head to the black, wrought iron bench that is closest to the trail and sit a spell. Continuing along the trail, you travel along a berm that separates West Waushacum Pond on your left from The Quag on your right and cross over a steel bridge. This bridge was surplus from Boston's "Big Dig" project. A lot of trails have benefited from surplus bridges from the "Big Dig". At 1.6 miles, the trail currently ends at Gates Rd. The Gates Road parking lot is located directly across the road. 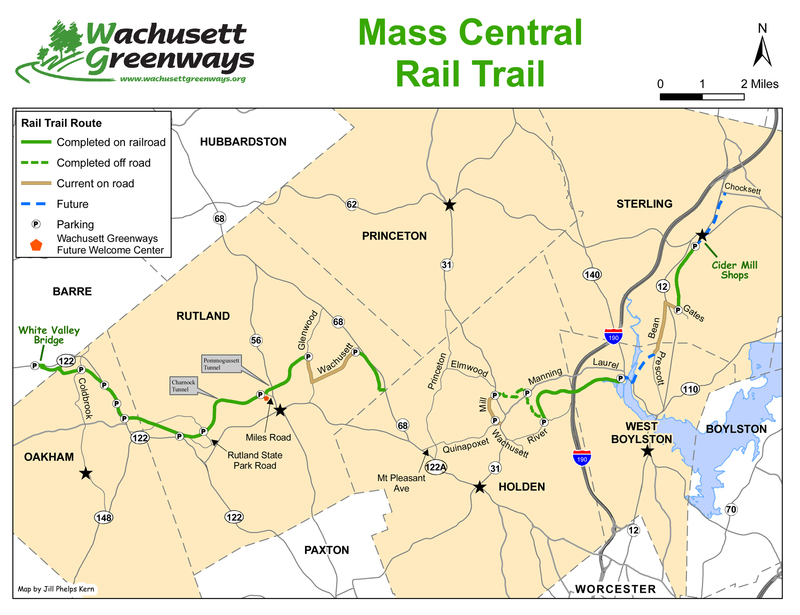 Note; To connect to the next section of the Mass Central Rail Trail in West Boylston, which also consists of stone dust, you have the option of on-road biking to reach the trail head via the Route 140/Bean Road Connector. It's a distance of about 3 miles along residential roads and a section of hard packed, grass covered "woods" road. However, because it contains some steep hill sections and some rough surface areas I only recommend it for mountain bikes. Also, a short section is along busy Route 140 and so it is not recommended for children. From the Gates Road parking lot; Head west up Gates Rd to Route 12 and cross over. Use extreme caution as there is no crosswalk over this busy road. Continue along Gates Rd to Bean Rd and turn left. This is a residential road with low traffic volume. Cross through the intersection and soon, the road narrows and becomes rougher. The road crosses an invisible boundary and becomes Prescott St as it enters West Boylston. After about 1 ½ miles you cross over some railroad tracks and then a brook. Look to your right for a yellow gate. This takes you up a hard packed, grassy "woods" road that was formally Pleasant St. The road heads uphill for roughly a half mile and then back downhill until you reach another yellow gate where the road is paved. Turn right when you reach Route 140 after about 2 ½ miles. This takes you over the Wachusett Reservoir. Use caution, as the shoulder is narrow in spots. At the intersection where Route 140 turns right, you turn left down Thomas St. Just before the Wachusett Reservoir parking lot on the right, will be a paved drive that will take you to the trailhead. See; Mass Central Rail Trail; Holden-West Boylston .